All the lasting document protection you want without distracting glare---that's what you get with these Avery Standard Weight Sheet Protectors. The durable, semi-clear material makes these sheet protectors ideal for moderate use, and the archival-safe properties ensure that your documents stay well preserved without degradation and print transfer. The Avery Easy Load feature makes it simple to slide papers into place, letting you insert up to 10 sheets in each page. With these sheet protectors, all you'll see is quality. These works perfectly for protecting flyers or anything you want to post outside and keep protected from the elements. The keep the rain out and help prevent sun fading. They are reusable so it's a great investment if you do a lot of posting outdoors. I love these sheet protectors. I believe they are very sturdy and hold up to all the use I give them. I use them in my coupon binder and I am always in and out of there. I stuff my coupon insterts in them and they work great. Would highly recomend and have many times. Welcome to MyBinding Video. 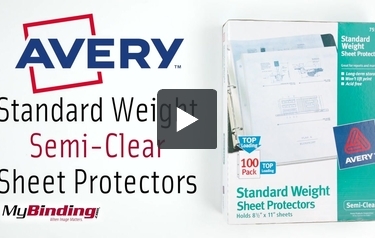 These are the Standard Weight Semi-Clear Sheet Protectors from Avery. These affordable protectors are ideal for moderate use. They’re made with archival safe poly to ensure that your documents stay well preserved without degradation or print transfer. The Avery Easy Load feature makes it easy to load up to 10 sheets of 20 pound paper. These protectors are available in packs of 100. For more videos and all your binding needs, visit MyBinding.com.